Define rules and templates to send transactional and marketing emails related subscription sales. Scheduled publication emails, for example weekly or monthly newsletter posts when email is considered to be a channel for delivery of journalistic content - covered in a separate article. This support article covers how to sell subscriptions and related products via email, i.e. point #1 and #2 above. Publishing of journalistic content via email, #3, is covered in a separate article under Production. 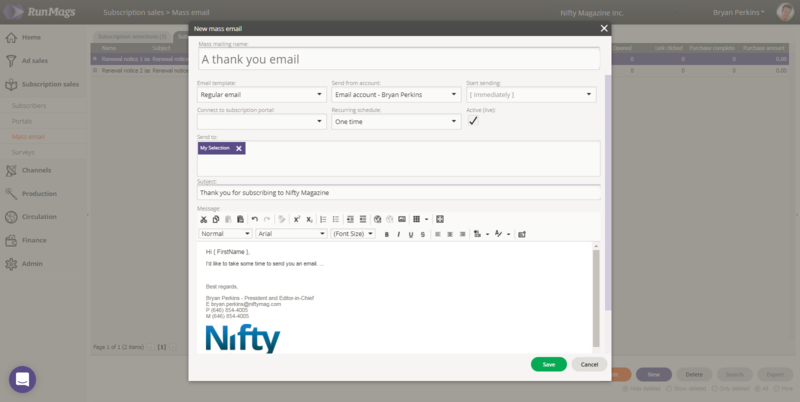 We have another article on how to set up automated subscription renewal emails, which you can access here. A user with subscription sales access can design email campaigns to the entire subscriber database and/or to specific segments of choice. Under Subscription sales >>> Mass email, you'll find two tabs. In the first one you create a selection of subscriptions and the associated subscribers, based on various selection criteria that you can chose between. To create a new selection, click the lower new button. Use the filtering tools to select what criteria that should be met in order for a subscription/subscriber to be included. 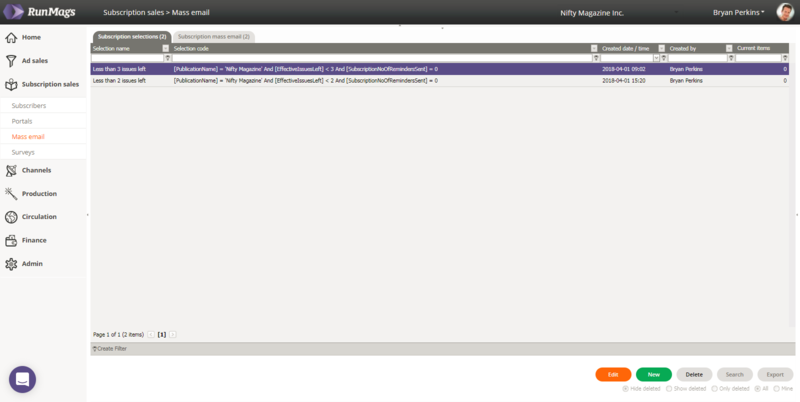 In the example below we've selected the publication and how many issues that are left. Give the selection a name and save it. You'll be able to access this defined selection in the future and as time passes and other subscriptions/subscribers meet the selection criteria, they will be added to the list automatically. Think of the selection as a living list that gets updated as subscriptions and subscribers gets added and updated. In the example below, our search criteria only returns ten records so my personal business email account like Google G Suite or Microsoft Office 365 will be able to deliver these. Both Google and Microsoft has limits on how many emails they will deliver per day from these accounts, normally around some 2,500 emails per day. In case the selection contained thousands of people, I would need to set up a separate email account, for example a marketing email account through a provider like Sendgrid, who is our emailing partner. Contact support@runmags.com if you'd like to set up a Sendgrid account where volumes begin at 50,000 email per month. In the subscription mass email tab, click the lower new button to begin designing your message. In the example below, we're designing a simple one-time thank you email to be sent out, but you can also create automated messages that are sent on a weekly or monthly basis, for example for renewal notices/offerings. You can base the message on one of your email templates, which email account it will be sent from, at what time, as well as connecting it to a renewal portal. Check out this article on how to create an automated renewal email notification. Make sure you tick the check box to activate the email once you're happy with the message. Once you click Save, the campaign will be live and emails will start sending and you'll be able to view stats on how the emails are being delivered and opened.